It’s probably about time I got around to finally writing about some of the books that I read, a little in the vein of the 52-in-52 meme. This probably won’t start a trend, but Milovan Đilas’ Conversations with Stalin is full of sufficient tidbits to make it worth writing about, albeit unfortunately a little on the short side. 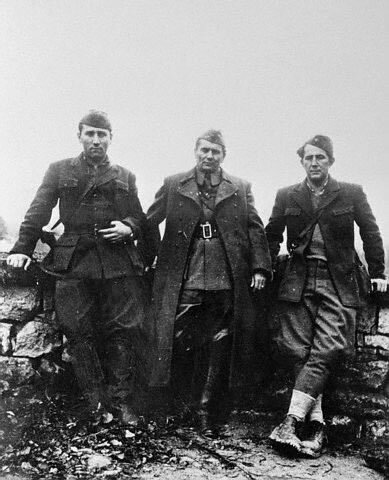 Đilas (pictured, right) was one of the key figures in the Yugoslavian Partisan movement during the Second World War, and maintained an influential position in the post-war government alongside Josip Broz Tito (centre), Aleksandar Ranković (on the left), and Edvard Kardelj. He started to write his memoirs in the mid-50s and decided to set his encounters with Stalin aside for separate treatment, but his outspoken criticism of the Yugoslav system resulted in his arrest and imprisonment in 1956. He restarted this work in 1961, which eventually brought about his re-internment.